These crisps are an oven-baked version of the Italian frico (fricos are made in a pan on the stove). It's just basically thin rounds of baked cheese. One of the cool things about it is that they are moldable when still warm. If you drape them over an upturned glass, they will form a cup that you can fill with anything you like (example: guacamole). It makes a really nice presentation for a party. Pile 2 tablespoons of cheese (depending on the size you want) on a baking sheet covered with a silicone mat, or parchment paper oiled on both sides. Flatten the tops so they are in more or less an even pile. There should be at least two inches between smaller mounds, 4 inches between larger ones. If you want to mold the crisps into a shape, the thing to do is to "drape" them while still warm. You can make cups by draping over an upturned glass, or "taco shell" shapes by draping over any cylindrical object such as a rolling pin or the side of a straight-sided glass. Note on the type of cheese: You can use any kind of hard cheese, but the results will be different depending on the type. Hard cheeses such as Parmesan, Romano, and Asiago will make a crisp "shell," whereas cheddar will be chewier and "lacey" (the fat separates out), though still firm. Softer cheeses such as mozzarella will not work well (think of the cheese on top of pizza), and creamy cheeses such as Brie will just form a puddle. Toss the cheese with any seasonings you'd like—garlic powder (about half a teaspoon for a cup of cheese), hot pepper powder, or even cinnamon. Or leave plain. There are really endless ideas, only limited by your imagination. 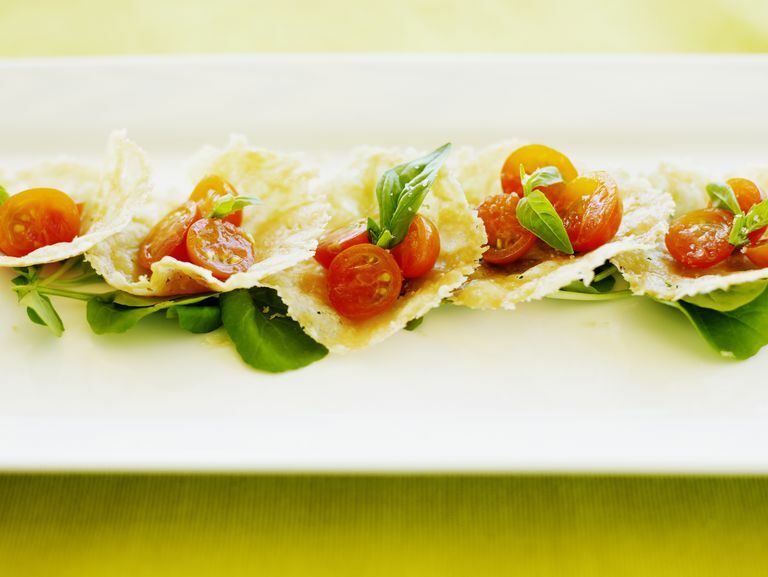 Pictured is cheese crisps served with cherry tomatoes and basil, or you could fill molded crisps with fruit (such as sliced strawberries or apple), dip (such as spinach dip or guacamole), or salad (such as ham salad). If you have made flat crisps, spread them with sugar-free jam (I'm not kidding), or spread you want, or eat plain.